Set the stage for a calmly sophisticated bedroom atmosphere with this beautiful sleigh bed. 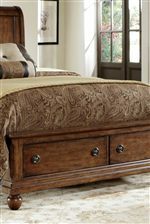 Crafted from poplar solids and pin-knotty cherry veneers or birch veneers, this bed represents a tasteful blend of classic Louis Philippe styling and a rustic, woodsy flavor. The gentle curve of the headboard and footboard encourage a natural sense of tranquility, while traditional bun feet lift the bed gracefully from the floor. This bed is available in queen and king sizes. The Rustic Traditions King Sleigh Bed Set with Bun Feet by Liberty Furniture at Miskelly Furniture in the Jackson, Pearl, Madison, Ridgeland, Flowood Mississippi area. Product availability may vary. Contact us for the most current availability on this product. 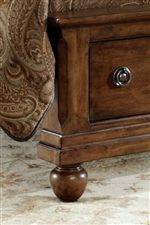 The Rustic Traditions collection is a great option if you are looking for Transitional furniture in the Jackson, Pearl, Madison, Ridgeland, Flowood Mississippi area. 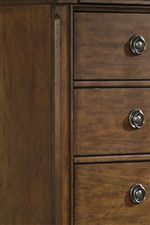 Browse other items in the Rustic Traditions collection from Miskelly Furniture in the Jackson, Pearl, Madison, Ridgeland, Flowood Mississippi area.